The advantages of a ball return pool table over a drop pocket table on a free play pool table. We thought we would point out the differences of a ball return pool table which all DPT pool tables are fitted with as standard, over a drop pocket pool tables. We are asked about the difference between the 2 options quite often by customers. This basically means that when you pot the balls into the pockets, they return to an opening at one end of the table. The ball return pool table has a set of internal runways that take the balls from the pockets to the open end. A drop pocket table does not have these runways and when the balls are potted they sit in the pockets. Tables with ball return pockets are kept clear and do not fill up with balls, with drop pocket tables you will find the pockets will need the balls removing from them during the game, as the pockets will fill up causing the balls to jump out of the pockets. The other main feature with the ball return is that at the end of the game the balls will be in the return opening, ready to be racked for the next game. 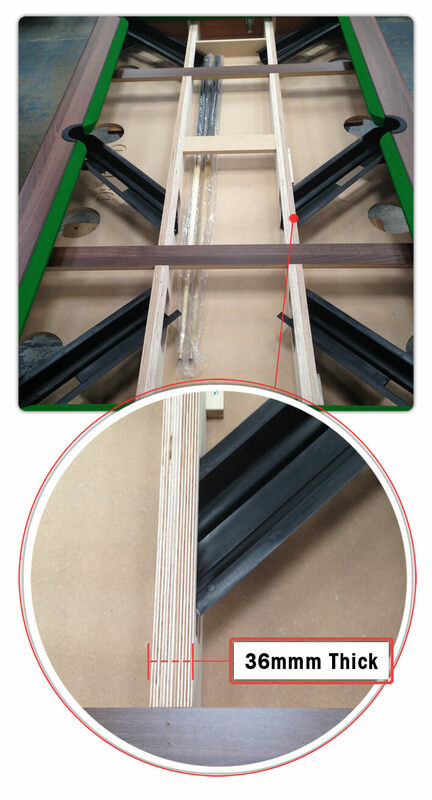 We also manufacture the Monarch and Emirates free play pool tables, These models also offer an additional feature, as well as the ball return system, they also have a cue ball separator, this system sends the cue ball to the ‘D’ end of the table, if its potted, and the rest of the balls to the racking end of the table. Similar to a commercial pool table that you would see in a bar but without the coin mechanism. This is the ultimate system on any free play table.